Plant juices can be required for research at your laboratory. However, not only juices might be desirable to extract from plants. For example, buds and seeds from a potato can be removed for plantation in the greenhouse. 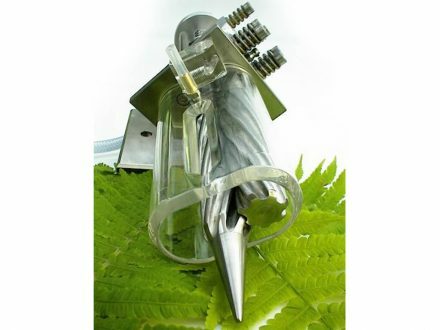 For bud extraction, we supply the bud blankout device. This device consists of a stainless steel stand, a cutting head and a hand lever that can be mounted on the left or right side. For the seed extraction of a potato berry, the berries stoning device is available. This device has three slowly rotating stoning cones. When half of a berry is pressed on the cone, the flesh and seeds are separated from the skin. 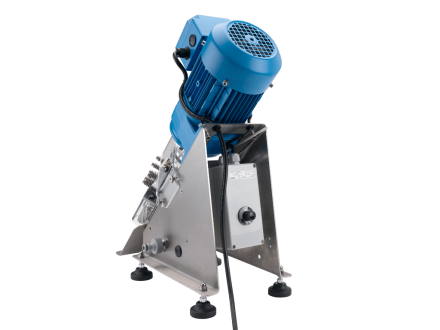 The leaf juice press is ideally suited for extracting juice from plant parts such as leaves, buds, and germs. The leaf juice press is available with two special roller systems: a corrugated roller system for solid leaves and a smooth roller system for thin leaves. The MEKU Leaf juice press. Each system uses two rolls that press against each other to squeeze the juice out of the leaves. The juice flows down to the tip of the lower roll and can be collected in a culture tube, microtiter plates or another cultivation vessel. Plexiglass is used around the rollers for safety reasons and as splash protection. Furthermore, a safety gear between the rolls and the motor prevents damage if unsuitable materials are pressed. A special rinsing nozzle cleans the rolls with water. The leaf juice press is available with both roller systems, and with each individual roller system separately. The Germ juice press is provided with a corrugated roller system for solid material. It works exactly the same way as the leaf juice press and the tuber press.The difference between this device and the other two is a shaft above the inlet port, through which germs can be pushed into the roller system. This germ juice press comes with plexiglass protection, a safety gear and a special rinsing nozzle. A special germ juice roller system is available for the leave juice press. An electronical buffer unit is recommended to facilitate the process of collecting juice from the tip of the lower roll, especially while working with materials with low liquid content. The plant juice is captured by the buffer unit and mixed to a homogenous mixture. This also reduces the oxidation of juice while extending its preservability. 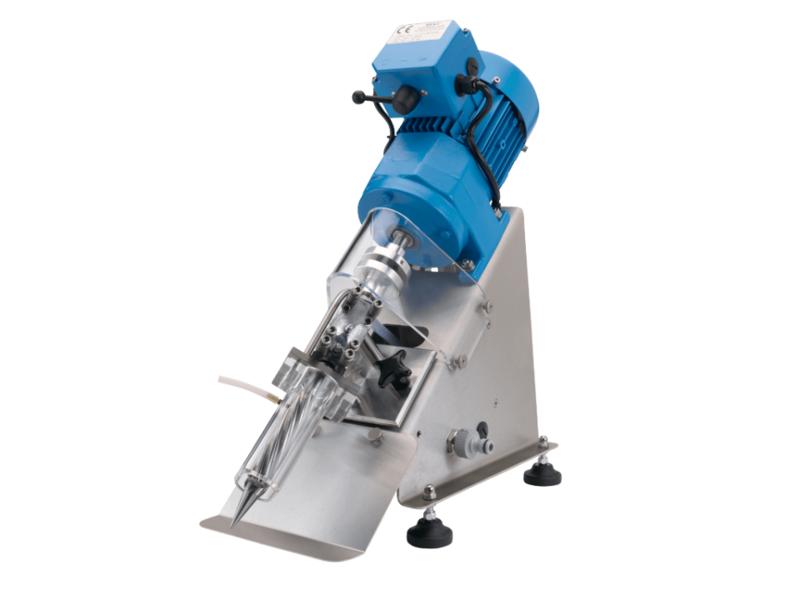 The tuber juice press is suited for extracting juice from tubers (potatoes with and without germs). The tuber juice press is equipped with a corrugated roller system for solid materials. 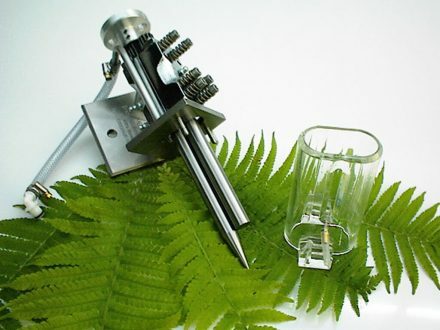 It works the same way as the leaf juice press, however, this system is also outfitted with a pre-cutting head to cut a solid object into smaller pieces, thus facilitating the pressing process. Compressed air is required for the tuber juice press. The tuber press is also provided with plexiglass, a safety gear as well as a special rinsing nozzle. The back side of the MEKU leaf juice press.